Shrinking - The Chip's Challenge Wiki - The Chip's Challenge Database that anyone can edit! Shrinking is the 98th level in Chip's Challenge 1, and is named because the nine islands get progressively smaller in their intended order of 5, 6, 9, 8, 7, 4, 1, 2 and 3, with thus more chance of colliding with a sliding pink ball. 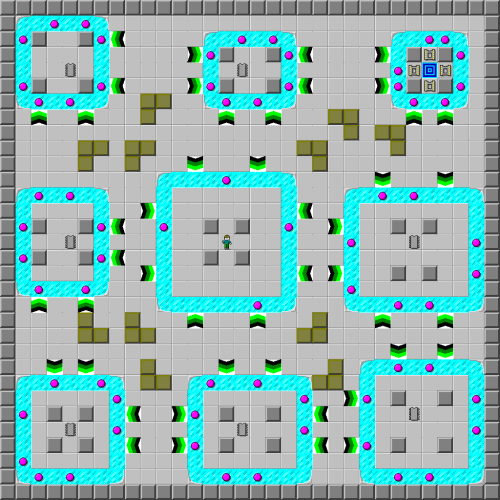 The blocks placed around the level, like in Metastable to Chaos, are intended to make it easier to pass through the ice rings by interrupting or completely blocking the sliding balls; however, none are truly necessary, and occasionally the blocks can complicate the route by causing slide delay and trapping balls between them. Spiral through the areas as directed (RD 2L 2U 2R), waiting  inside rings 5 and 8, [1/2] before entering rings 4 and 1, and [1/2] also when leaving ring 2. The two  waits in this route are easier substitutes for [1/2] waits, as the only place where a [1/2] wait makes any difference (excepting the very beginning) is just in front of the ice, which will cause the spring slide due after sliding over one ice tile to disappear, thus changing this into a  loss. In these two locations, simply waiting  does the job equally well (and can be measured by wall tiles inside the rings), while in the other three this will cause further losses because another pink ball is exactly one turn behind and Chip must wait again. Perfection is required, as the bold time is -.9.